Holly Brown Gelato contains 50% less fat than many of the premium ice creams. Made from natural ingredients and real fruit. No preservatives or artificial flavoring. Gelato is Italian for ice cream. So is gelato simply ice cream with a fancy name? No. It's much more delicious! Ice cream has a minimum of 10 percent fat, gelato is made with a greater proportion of whole milk to cream, so it contains more like five to seven percent fat. Gelato is churned at a slower speed than ice cream, so it's denser because not as much air is whipped into the mixture. 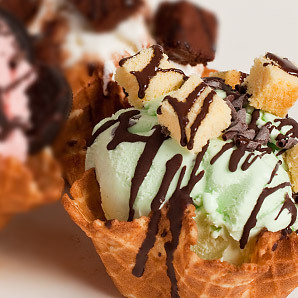 Gelato contains about 25 to 30 percent air, while ice cream can contain as much as 50 percent air. As for that wonderful, rich flavour, since there's not as much fat in gelato, it doesn't coat the mouth in the same way. So the flavours are much more intense. At Holly Brown our rich, luxurious icy treats will leave you craving more. There are a huge range of flavours to choose from including chocolate fudge, wild berry, mint and coffee and many more, all of which can be mixed with your favourite mouth watering toppings. Alternately you can indulge in our deliciously refreshing low calorie frozen yoghurt. Share in the gelato experience. Watch our team work the ice cream on the tailor made 'cold plate' to form your scrumptious dessert. You may even see the odd ball of ice cream being tossed around by our skilled staff! Served in a tub or inside a crisp freshly baked waffle cradle, come and experience ice cream like you've never known it. Let your senses guide you to a little Italian decadence right here on Stanley Street.